So often, wine conforms to expectation – perhaps that is simply what the wine is like, or maybe that we can be too blinkered. But sometimes our expectations are given a jolt. Pinot Blanc is at best neutral and refreshing, right? Merely an inexpensive food-friendly wine? Well, no, not always. With memory jogged by my tasting note database, I can think of as many as… let me see… four exceptions from personal experience: Kuentz-Bas 2004 (appley and floral), the English wine Stopham Estate 2013 (gooseberry and herbs), Weinbach Réserve 2008 (for all the world like a botrytised Pinot Gris), and finally, the subject of this blog post. 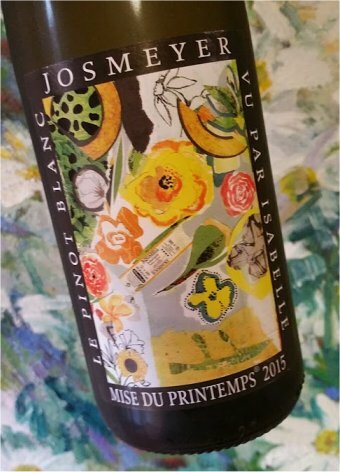 The full name on the label is a bit of a mouthful, and it is difficult to know the intended order of reading, but it is perhaps Josmeyer, Mise de Printemps, Vu par Isabelle, Le Pinot Blanc, with the appellation of plain Alsace. Prices in the UK seem to vary from £12 to £22, which IMO is the difference between excellent value and barely worth it. This entry was posted in My tasting notes and tagged alsace, pinot blanc, tasting, tasting note. Bookmark the permalink.